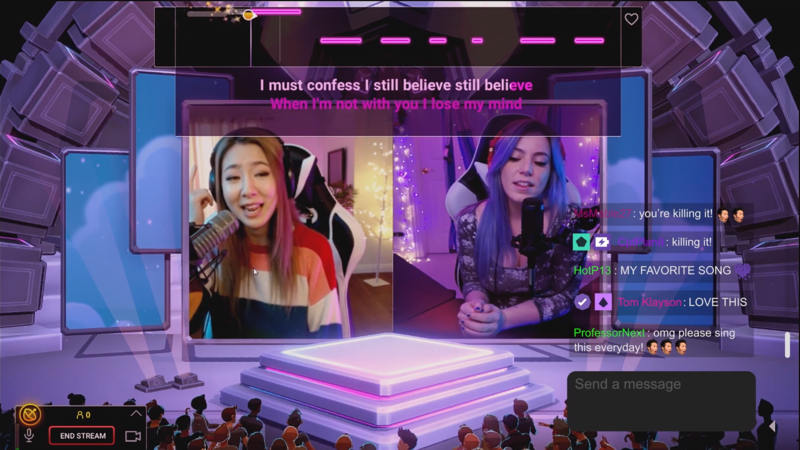 On April 13, Twitch launched its first game, Twitch Sings. It’s a karaoke game allowing users to stream their performances to their channels. While it’s an online-only title, shy singers don’t have to broadcast their singing. And if they want to, they can always choose to appear as avatars on a virtual stage. Twitch Sings offers a library of nearly 2000 songs (none of them are originals, all are covers). You can sing them solo or invite friends for some quality co-op singing in a duet. You don’t get to sing simultaneously, though. To make things even more interesitng, fans can request songs and or come up with challenges for you. Singing with your tongue out, for example. Or like you are underwater. There is an evaluation system too. Hit the right notes, get those cheers from the livestream viewers, and the game will reward you with coins and XP. For Twitch itself, the new title is an engagement and retention tool, which explains its free-to-play nature.